Since his birth in 1973 Juan Carlos has lived in the community of Silencio near the Savegre River. 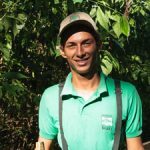 His interest and appreciation of nature began at an early age when he often accompanied his father fishing in the large mangrove estuary located at the mouth of the Savegre River. Fishing was an important source of income for the family, and also of animal protein for their dinner table. Juan Carlos remembers the constant scolding he received from his father for not paying enough attention to the fishing lines. “I was more interested in the monkeys, sloths, toucans, and crocodiles than the fishing”, he says. In 1996 the El Silencio Cooperative, where Juan Carlos worked for many years, inaugurated a rescue center for wild animals that had been injured or were being kept captive illegally. Perhaps the best known accomplishment of the center was the successful release of 21 scarlet macaws in 1998. There were 9 mated pairs 8 of which have since nested successfully within 20 km of Silencio. Juan Carlos worked at the center for 8 years taking care of the animals. Not surprisingly, his favorite animal is the scarlet macaw. Juan Carlos came to Hacienda Barú to work as a guide in late 2015. When asked which is his favorite tour he replied that it would be hard to say, because he likes all of the tours. 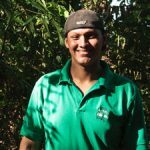 His passion is teaching people about the rainforest and how important it is to protect the flora and fauna for future generations.